Aloha from paradise! Literally. As I type this blog, I am sitting on our balcony on the 15th floor of our ocean view suite, listening to live music and watching the ocean. 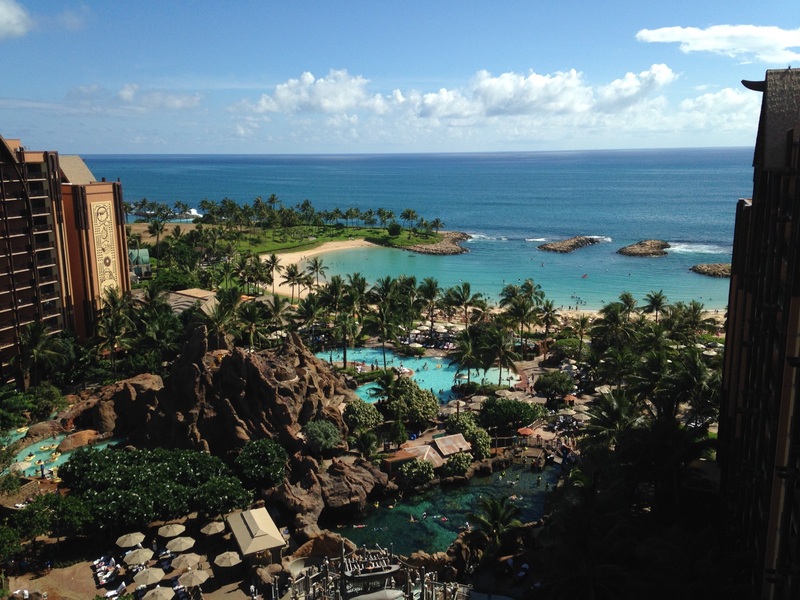 This is the view from our suite at the Aulani resort, paradise indeed. 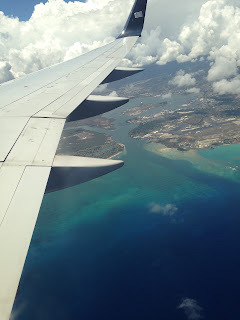 The good news is that we arrived safe and sound at the Disney Aulani Resort in Hawaii this afternoon. The only flip side is that it took nearly all day to get there, and I haven't been up for almost 24 hours straight since I was in college! 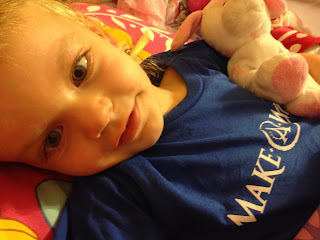 Grace slept in her Make-A-Wish shirt the night before our trip so she would be ready to go! 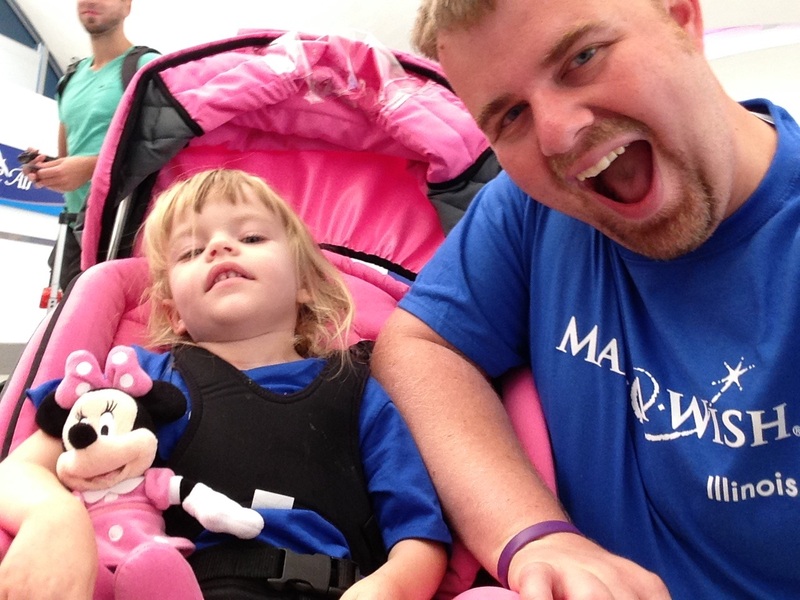 But being here for Grace's Make-A-Wish trip more than makes up for a long day of travel. We started out bright and early, with the alarm going off at 4 a.m. A stretch limo arrived in front of our house around 4:30 a.m. to take us to the airport, with a last minute surprise farewell from Grandma and Grandpa Galer. 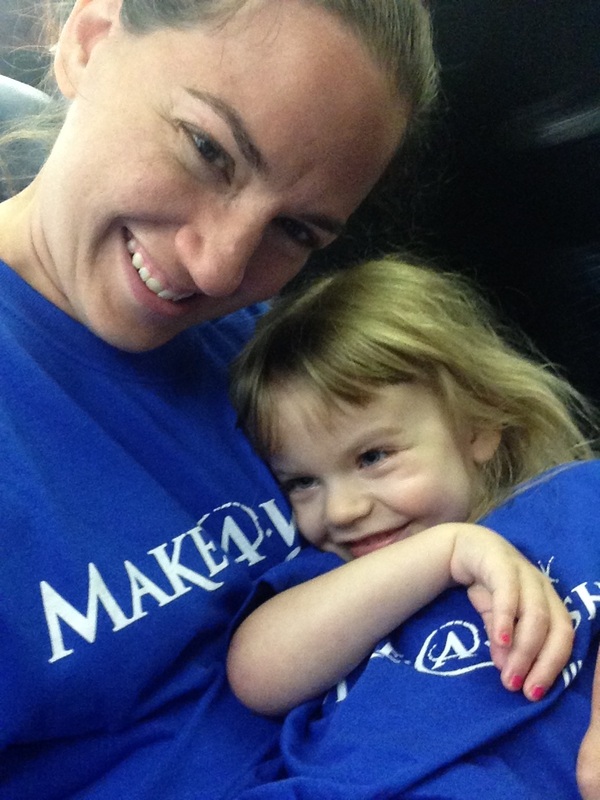 Two smiley girls on the airplane ride! We decided that riding in style like that is the only way to go too. Grace laid on a seat in between us, and we just enjoyed the ride into the sunrise, which is something we never, ever see. Grace and daddy cheesing at the airport! 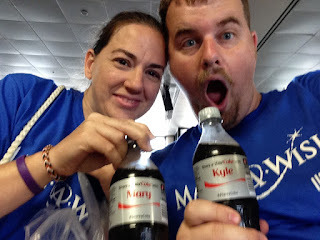 We had no trouble getting checked in at Lambert Airport in St. Louis, and the first three hour flight to Phoenix was a piece of cake. Grace slept nearly the entire flight, and we slept a good part of it too. Believe it or not, we found Kyle and Mary bottles of Diet Coke in Phoenix! After finding a quick sandwich for lunch at the Phoenix airport, we boarded another plane for the six hour flight to Honolulu. Since Grace slept the other flight, she didn't sleep for any of this flight, but she really did a great job. We read some books and watched part of Despicable Me 2 on DVD. She was a little cross the last two hours of the flight, but it didn't last long once we got off the plane. Hello, paradise. Here we come! A representative form Leis of Hawaii was there to greet us as we got off the plane. Grace and I got real flower leis, and Kyle got a shell one. Grace's smile when she got hers was priceless. And she only tried to eat it a little bit on the cab ride to the resort. 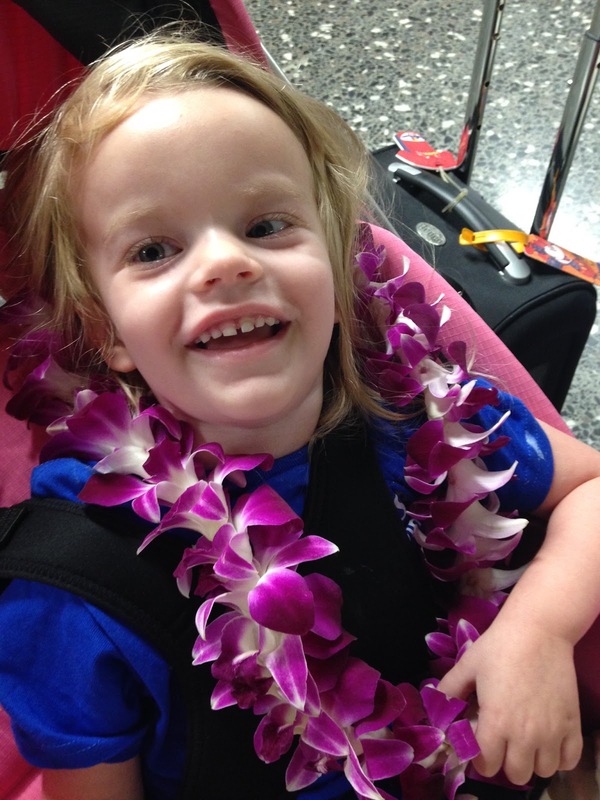 Grace was all smiles when she got her beautiful purple lei. 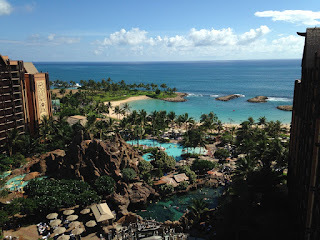 After we collected our luggage, we made the 30-minute cab ride to Aulani, which has to be one of the most beautiful places on Earth. When we got out of the cab, a bellman immediately came to collect our bags while someone from the hotel met us to get us checked in. 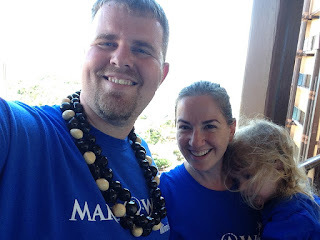 They had more leis for Kyle and I, and a special Menehune necklace for Grace. Everyone who helped us on our journey, treated us like royalty, and we feel so truly blessed to be part of this Make-A-Wish experience. Our first family photo op in Hawaii! 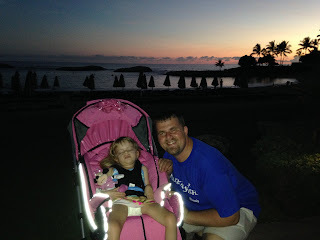 Although we arrived at Aulani at 3 p.m. in the afternoon Hawaii time, it was 8 p.m. our time, and without a nap, Grace was getting a little feisty. She and her daddy laid down for a nap, while I went to get some groceries for the room. Then Kyle and I ordered room service while Grace snoozed. Sunset in paradise, day one. We woke her up around 7 p.m. to take a quick walk around the resort. Most of the pools were closed already, but we decided to take it easy anyway and get rested up for the week, which will probably be one of the best of our lives. We are so grateful to everyone who has ever donated to Make-A-Wish - you truly do make dreams come true. I am enjoying this trip -- via your blog -- almost as much as you are! Wonderful sharing. The Grace Race Goes Global!